With a little more than a week left for this special session of the Texas Legislature, lawmakers are preparing closing arguments — and obituaries — for their pet issues. The loser talk is starting to leak into public conversation at the Texas Capitol. Lawmakers who last month were gung-ho about going 20-for-20 on Gov. Greg Abbott’s legislative priorities now say, quietly, that they never really thought everything would pass — but that they didn’t think things would look as gloomy as they do right now. Abbott’s 30-day special session is, as of Wednesday, 23 days old. His agenda for this legislative overtime has 20 subjects on it, and not a single bill he wants has passed both chambers and landed on his desk. It’s not looking great, kids. Legislators are starting to build their excuses, to write their obits for this or that issue, to prepare anyone who’s listening for the letdown. Senate Republicans held a news conference on Tuesday — with a week left in the special legislative session — to remind voters that they’re still in favor of public education. But look at that the way an art critic looks at negative space, at what’s not in the picture: The Senate is telling us they’re not likely to pass a House bill infusing $1.8 billion into Texas’ public schools. The senators want to create a commission that would consider “a comprehensive, systemic overhaul of the school finance system.” That commission would presumably make recommendations before the Legislature’s next regular session — in 2019. The Band-Aid they’re picking at is the House’s attempt to lower local school property taxes and to restore some of the per-student funding the state has cut over the last decade. House leaders, like state Rep. Dan Huberty, R-Houston, who chairs that chamber’s Public Education Committee, contend the school finance system has been studied to death and that the state should act, even if it’s painful, right away. There’s a progress report kind of like this one on property taxes, on the “bathroom bill,” on local tree regulations and permitting — on many of the issues the governor put on his summer to-do list. Some of this is deadline talk, where lawmakers are making their final pitches to each other (and to the voters outside) about the issues at hand. It could be the beginning of an explanation of why an issue is in trouble; it could be the start of a final, successful negotiation. During the regular session that ended just a couple of months ago, the Senate was ready to act on school finance, but with a couple of tweaks that proved unacceptable to the House: a private school voucher program for students with disabilities, and a much smaller infusion of state money. It’s not that they won’t move. They just need the right offer. The House and Senate are sitting on each other’s proposals for limits on rising property taxes proposed by Abbott and championed by Lt. Gov. Dan Patrick. That issue isn’t dead yet, either, but some lawmakers are starting to talk the way relatives confer outside the hospital rooms of the deathly ill. 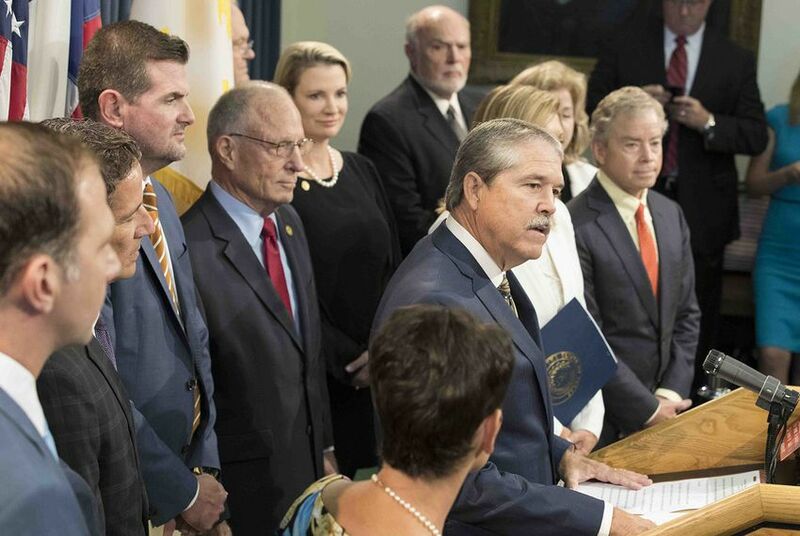 The only legislation that has to pass — so-called “sunset” bills that would extend the lives of five state agencies, including the Texas Medical Board that licenses doctors — is scheduled for Thursday consideration in the House. It’s already through the Senate. Much of what’s left is political gravy, potentially more urgent in next year’s primary and general elections than in the state’s law books. That’s up to Abbott. If he doesn’t get all that he asked for, the governor can always call them back for another 30 days.